These are so much fun to whip up for a celebration on 5th November! 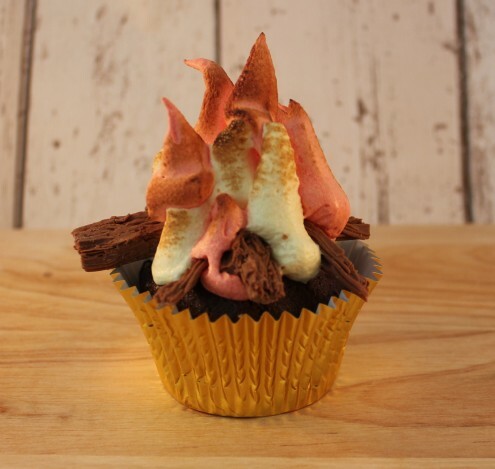 This is my take on the classic Bonfire Cupcake, using my Vegan Dairy-Free Chocolate Cupcakes and Italian Meringue though you could use any of my Cupcake or Frosting Recipes to copy this design. Enjoy eaten with gloved hands and sparklers, outside in the warmth of the bonfire. Begin by baking your cupcakes and allowing them to cool completely. I have used my Vegan Dairy-Free Chocolate Cupcakes for my Bonfire Cupcakes but you can use another flavour if you wish. To make them a little more autumnal, I have added a teaspoon of mixed sweet spice to the mix. Prepare a quantity of Italian Meringue. Just click here to be taken to my recipe for this. Again, you could simply use a Classic Vanilla Buttercream for this design but the meringue is going to allow me to make a final flourish! 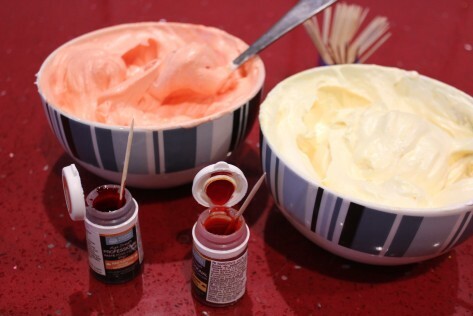 Divide your Italian Meringue between two bowls and colour orange and yellow using food colour pastes. You can also use food colour gels for this but not liquid colours, as these will dilute the meringue. Spoon into two piping bags. Snip the ends of your disposable piping bags to create an opening of around 1cm. 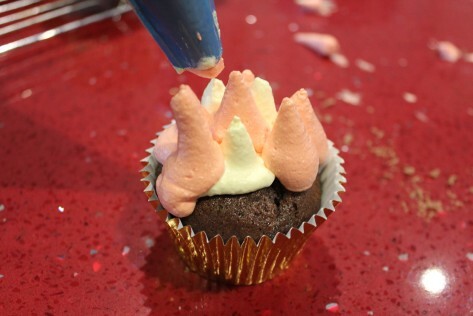 Alternating between orange and yellow, point the piping bag down towards your cupcake and pipe small pointed dots. These are easy to make by squeezing until you are happy with the size, stopping squeezing, and then pulling the bag away. This is what creates the point. Build your pointed dots into the shape of a flame. You can be quite organic about this – they don’t need to be perfectly symmetrical or anything like that! 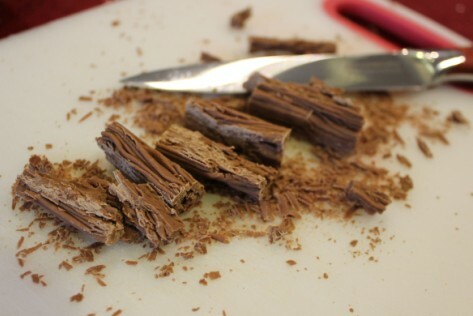 Cut up chocolate flakes into three length ways and then split them into thinner sections. This is a messy, flaky job but… yum! Arrange at the bottom of your meringue fire, pushing short lengths of flake into the meringue. Finish your flame with a light toasting at the very top ends with a chef’s blowtorch. 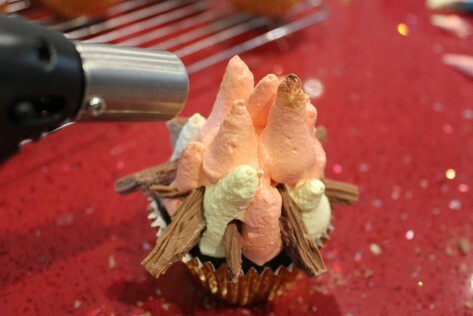 This gives your cupcakes the taste of the bonfire too. How cute do these look? A quick, easy, and rather tasty way to celebrate Bonfire Night.